Ready, steady, go. Yes, the Olympics are about to start and, so, we put high fashion on the starting blocks for the July issues of Vantage and Mayfair, the prestigious London magazines published by the Runwild Media Group. 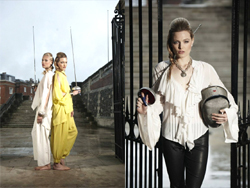 Throwing the javelin in Catherine Walker couture lace dress (far right) and Alberta Ferretti white jumpsuit (below right), practising archery in Catherine Deane (right), boxing in Veronica Moncho Loba (below) and fencing in Issey Miyake and Jexika (below left) were all par for the stylish course for our shoot at Harrow School with photographer Darren Paul and hair/make-up artist, Gill East. For a double page spread, our model, Hannah from Leni's Model Management, balanced with gymnastic ease, on a wall wearing a fabulous floaty frock by Aigner (left), ready to throw the discus, overlooking Wembley Stadium, one of the Olympic venues for the Games. Our main challenge was the rain which can effect both sporting events and fashion shoots whatever the month here in the UK. But with gungho Brit spirit we shoot come rain or shine armed with lighting and umbrellas and a prayer or two for clear sky (which, thankfully, was answered). We also had to share our location (and shelter) with Ralph Fiennes who was directing his new film, The Invisible Woman - and also starring in it as Charles Dickens Thanks to Harrow Enterprises, though, we had plenty of space and, so long as Ralph didn't get in our background while we were shooting, I didn't mind! !